A few years ago, when I started traveling for work, a strange thing happened with some of the web services I had been using. These cloud services, such as email, photo sharing and calendar refused to let me in to my account. I really needed to access them because my work processes relied on those services. Instead, the services insisted I was a hacker who had managed to discover my user id and password. The cloud services refused me from accessing my own account. That’s when I quit Yahoo. Now, I am in the process of quitting all my Google services as well. In 2012 and 2013 I was on a long journey that took me to several countries in Europe. I was using Yahoo Mail and Flickr quite a lot when things started to go wrong. Every time I moved to a new place, Yahoo wanted verification after verification to prove that I was really me. When I had done it a few times, and had been locked out from my accounts once, and had very frustrating moments with Yahoo support, I was fed up. I decided to quit all my Yahoo services. With the information that we have today (in December 2016), it is easy to realize that Yahoo may have been fighting with serious hacking problems just then, in 2013. Their solution was to make life hard for their customers without telling what had happened. 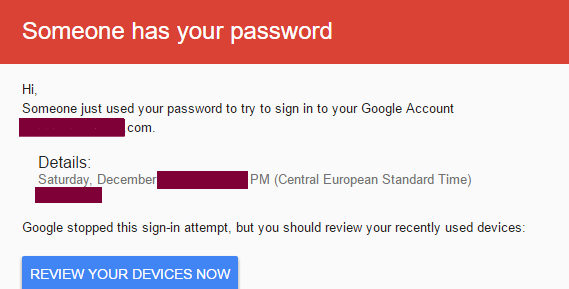 Someone just used your password to try to sign in to your Google Account [name]@[address].com. The first time Google locked me out of my account, I spent quite a lot precious time trying to explain the situation to Google Support. Nothing happened. That was it. I had enough of Google. For my work that requires traveling, it is a waste of time to try and follow Google’s verification instructions – only to be locked out. So, I am moving my work, business, and life away from Google. I understand and really hope that services like Yahoo and Google have security measures in place to prevent hijacking of accounts. If I login to my account in Edinburgh today, and in Dublin tomorrow, it is perfectly all right to ask verification for proving that I am really me. What I don’t understand is why both Yahoo and Google fail to recognize the credentials I am entering. For instance, Google’s verification process can send a message to a backup email address stored on the account. Going through this process doesn’t help. I am still a criminal to Google. I understand that Google has other ways for verifying customer’s identity, but whatever they are, I can not trust Google anymore. Google does whatever it wants with my data. I don’t have any hope to have any control over the data I have stored on Google’s servers. The risk with dealing with services like Yahoo and Google is simply too high. The critical moment when I need information stored on my account, or access communication services I have relied on my work, the services fail. They have been designed that way, and nothing I say or do will change it. 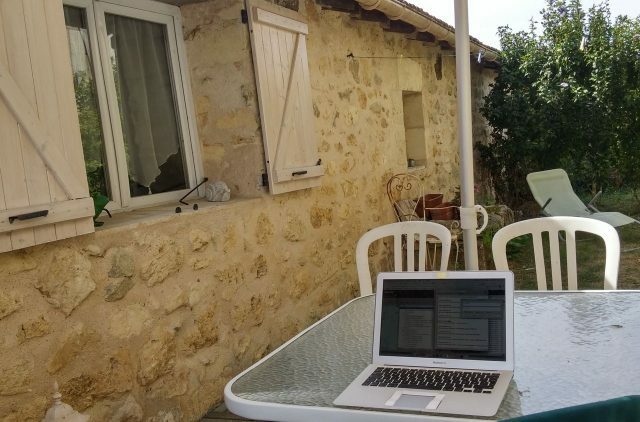 Since I will be traveling (and writing about it), I have started a long process of creating a whole new cloud working environment for me and for people I work with. It takes time and effort, because some choices prove to be wrong and as painful it is, switching to another tool is better than limping ahead with an unreliable or unsecure tool. – An email account from a reliable ISP (hosting company). Many ISPs give a large inbox (up to 1 GB) for the price of a domain name. Annual cost around 10-15 USD/Euros. –	Flickr is an excellent photo service – if you can login to your account. I am still looking for a replacement for it (won’t be Google Photos). –	Some hosted email services come with a calendar, some ISPs charge extra for it. I have been trying out Sunrise and Moxtra that are free. –	Google Plus social media service can be important for some people, but it wasn’t critical for me. Goodbye Google+. Other social media services, like Twitter or Instagram have co-operated smoothly with me on the road. –	In addition to backing up data to an external drive, find a cloud backup service. Forget Google Drive, and pay a few euros/dollars per month to a company that really knows what they are doing. I am traveling in Europe, so Hubic servers in France are never far away from places I am staying. –	Google Analytics can be difficult to replace as the web site analytics tool, but we are trying out Piwik and Open Web Analytics at the moment. Why am I discontent with Google and Yahoo services alone? Surely, I must be using social media services as well? Yes, I am. It is just that, for instance, Twitter, Dropbox, Skype, or Instagram have made life easy for customers who are traveling. They know someone is accessing your account from a new place, tell you about it, ask if everything is all right, and act accordingly. The difference with Google and Yahoo is that these services just work. Online security is not easy. Customers want to be assured that their accounts are in safe hands. For a service provider, it means balancing between ease of use and requiring customers to take a few extra steps. Yet, even tight security can be implemented so that customers who prove their identity are not locked out from the services they rely on their work. 2016-12-28 by ari in Technology. Tags analytics, backup, cloud, Flickr, Gmail, Google, services, web, Yahoo. Check out sandstorm.io if you’re really serious about taking control of your data and privacy. It’s still in beta, but it’s a credible solution for setting up a private cloud. It’s open source so you have complete freedom to set it up on AWS or DO or a private server, or you can pay a nominal fee to have them host it for you and handle the maintenance. Thank you, TB, for the tip. I have to spend some quality with Sandstorm and try it out on our server. Would two factor authentification be a possible fix to keep you from getting locked out of your google account? I consider verifying the backup email address as the second step, although it is not strictly two (different) factor authentication. I understand Google can verify my identity via mobile phone number, but I don’t trust Google to give the company my phone number. Two factor authentication using mobile phone with other services I can trust works fine. how did you get on with finding a good alternate email host. I’ve become so fed up with re-authenticating myself, that I’m also trying to move away from gmail. One thing I tried was mail.com, with the hope that I could redirect the gmail accounts to one mail account that is more sympathetic to travel. That way, you can simply stop having to use them when travelling. However on closer examination, that domain is also unsympathetic with travellers. I’d be interested to know how you’re faring, as I’m sure many other people out there fed up with gmail’s (and microsoft’s) inability to deal with an extremely common problem. I moved all my email boxes to an ISP. Many ISPs give you an email account when you buy a domain name. It is an annual cost, but very reasonable compared to the time and effort you lose with frustrating email services, like Gmail and Yahoo mail. So , you get a reliable email service that is under your own control and you get your own domain name. I have used Godaddy, and OVH.com (for European domain names). Godaddy gives you a 1GB email box for a domain name, and OVH even more (3GB). After I moved to these email services, I haven’t had any problems with accessing my email wherever I am, or whichever method I use to access the Internet. thanks for that Ari, I was just coming to the same conclusion myself. As you say, money well spent and probably live longer too, with the reduction in stress! Think I’l do the same.